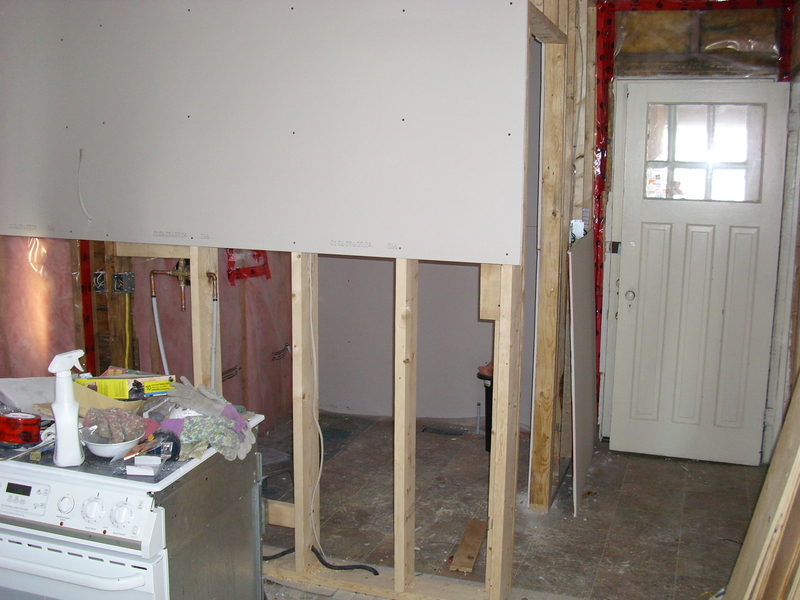 Here’s a glimpse at the bathrooms we’ve renovated or created during the past couple of years. The space used to be my kitchen! 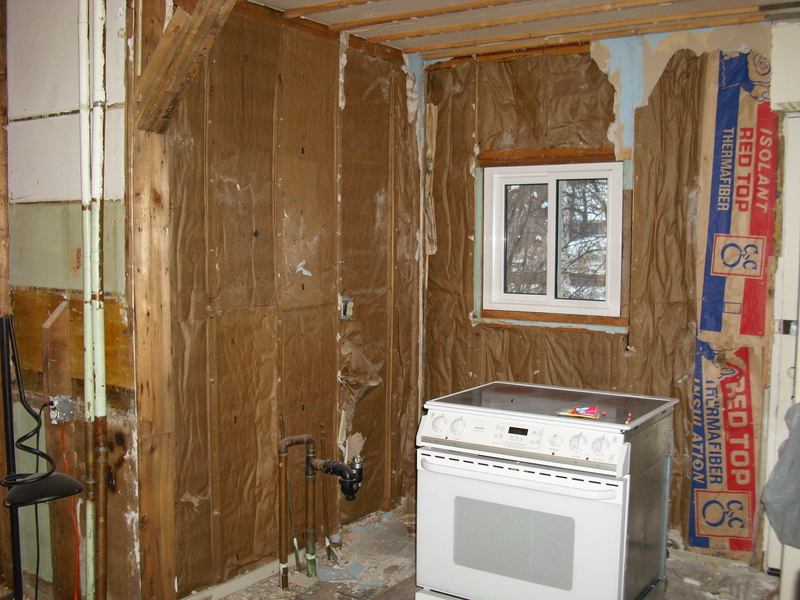 Here we are ripping it apart and keeping the stove for when it is accessible and usable! 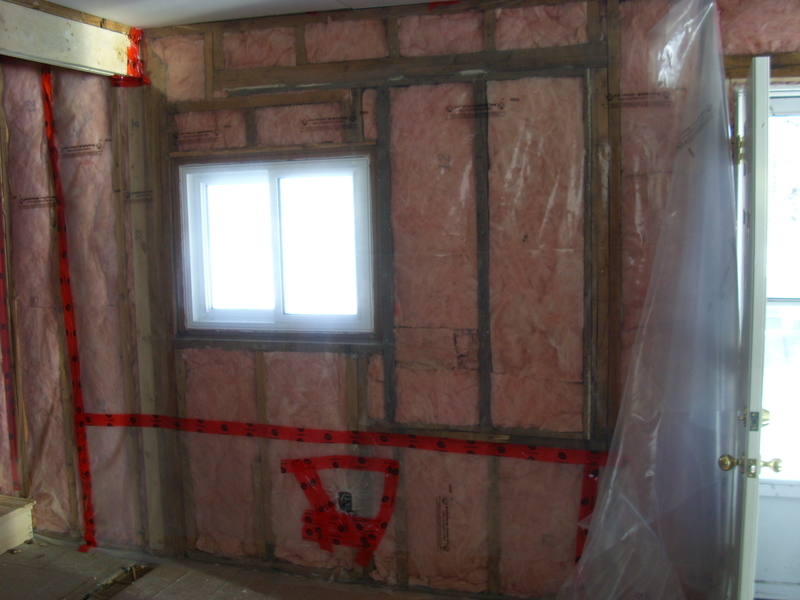 Totally empty now – reinsulated with R12 instead of R10, vapour barrier in place and ready to be framed. 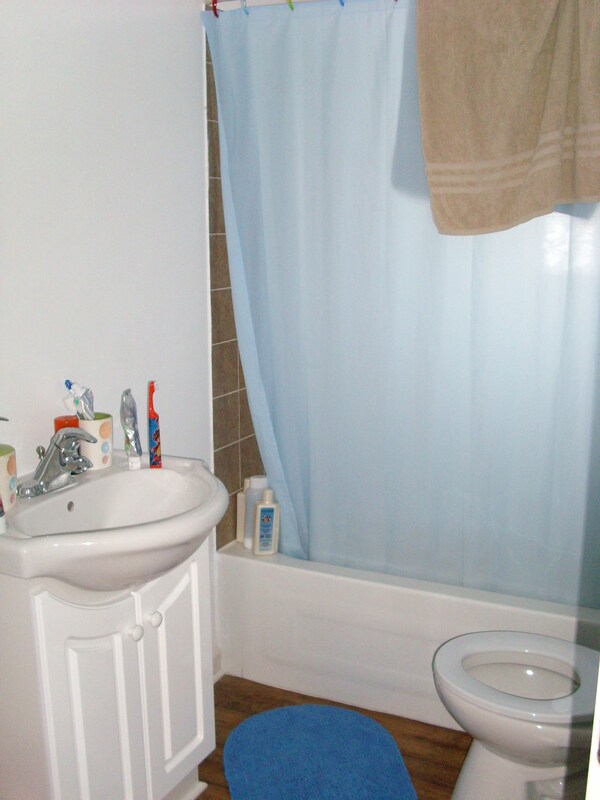 And here’s the new bathroom now – a small vanity and a corner shower. Being on the main floor means it’s perfect for guests and being next to the back door means it’s perfect for quick clean-up as little boys come in from playing! 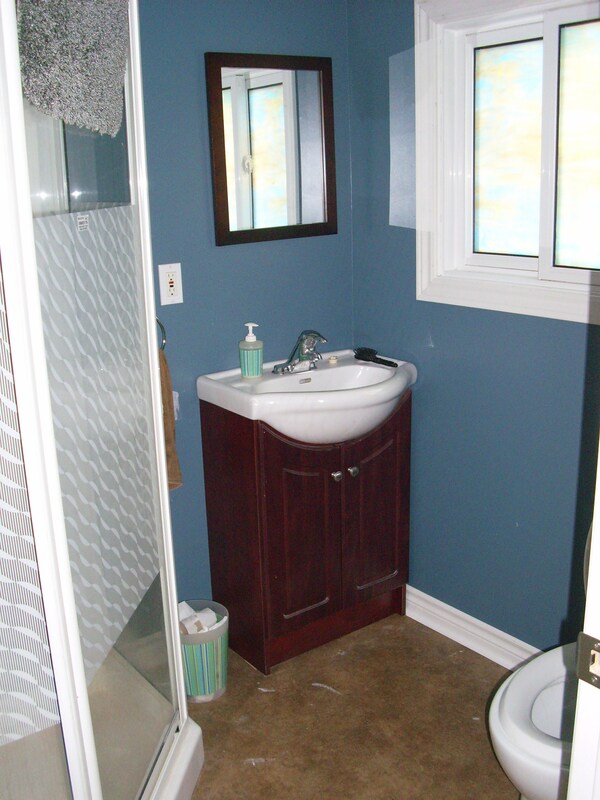 This is the upstairs bathroom after one round of renovation. The first round we had a new floor built, a tile shower and new bathtub installed, as well as glass blocks in place of an old, rotting window, a new toilet and a vanity we found downstairs in the basement. This round we finished it up with another new toilet (the one we bought 4 years ago was already kaput! ), left-over fibre floor from the playroom (so nice and soft and warm on the feet! ), new vanity so we could put the other one back in the basement, and we ripped out the old medicine cabinet that was practically falling off the wall. We still need a new medicine cabinet and a couple of shelves to store bathroom items, but this bathroom is great for our family! The basement bathroom has been untouched since we moved in. There’s an old claw-foot tub down there that we used to bath the boys in when they were babies. 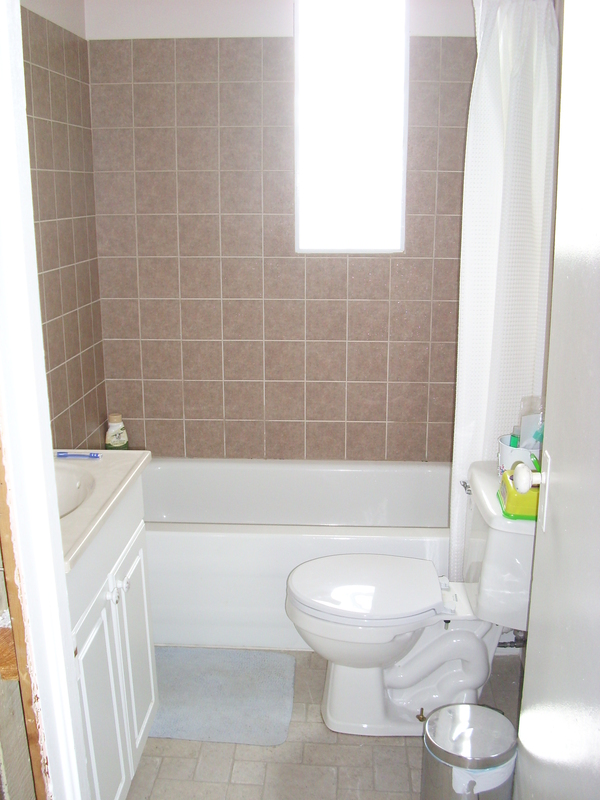 That tub was one of the main selling points for me on this house! Hopefully one day we’ll get around to fixing the basement and then I’ll post some photos then – but I have a feeling that’s far into the future! Next Marriage: What Is Your Vision?